Carl drew his comic book pages in ink over graphite on two sheets of conjoined Bristol board with a combined image area of 16" x 23.5". That makes it larger than even traditional "twice-up" scale! The boards was taped together on the backside. Normally always signed by the Duck Master himself in the lower right margin - often credited to the buyers name and even sometimes with date of art. 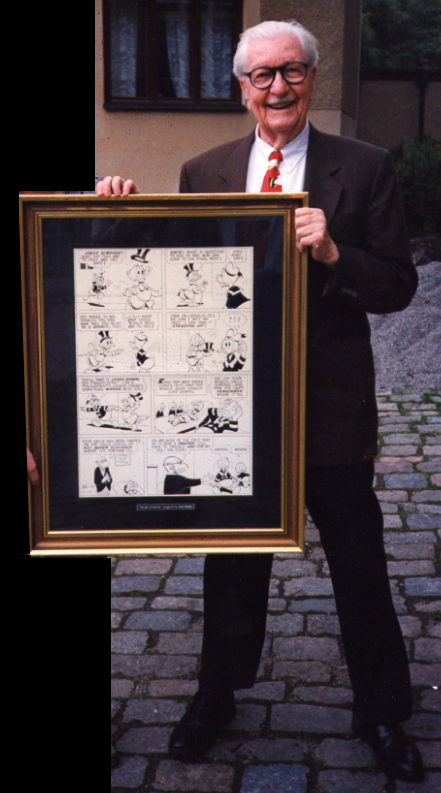 Carl Barks with the original comic book page 14 from the Uncle Scrooge story : "House of Haunts" - US-63. On this photo you really get an idea of the size of the original artwork ( 16" x 23,25" ). Of the 133 original pages that Carl was given back from his last editor, Chase Craig he sold most of them to fans and collectors in the period 1969 - 1978. He though kept one full story for himself ; US-59 ( North of the Yukon ) and also the first page from US-60, US-62, US-63 and 2 one-pagers. Carl noted full names of the buyers and also wrote down the month and year of sales including the price obtained for each and every page. 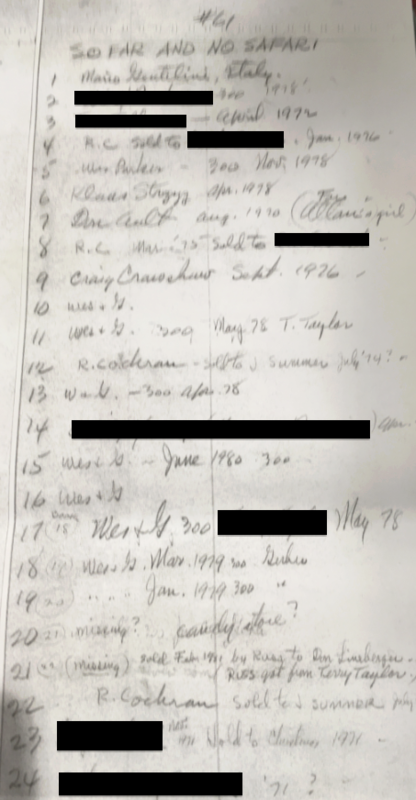 Take a look on Carl`s original selling lists from the survived stories from the 1960`ies underneath. Some "first movers" of buyers of original pages actually still own these nearly 50 years after they bought them.. This is an example of an original page. It is page 13 from the Uncle Scrooge story ; "North of the Yukon" and this page is one of the best from this 24-page story. You see all of the stories main characters on this page ; Scrooge, Donald, The Nephews, Barko and Soapy Slicks. - And second it is also a dynamic and action minded page. This is also the page where Scrooge and the sled dog "Barko" meet each other for the very first time. 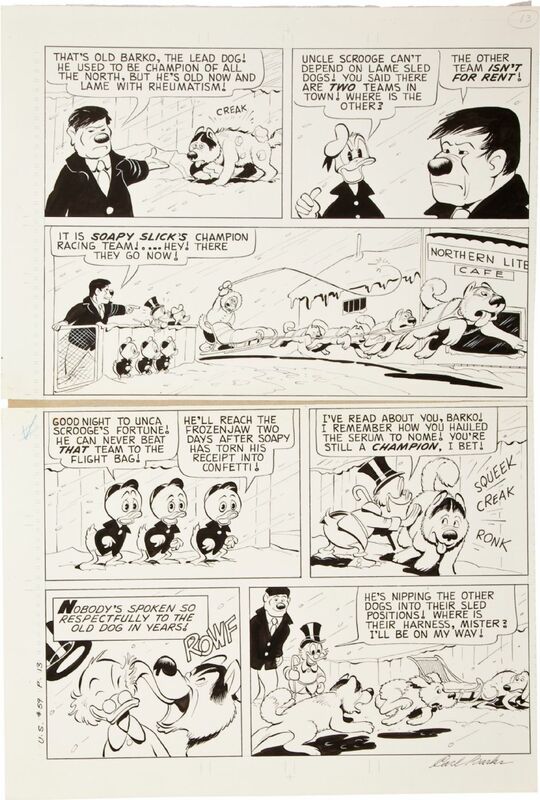 ..>The more I got to know Carl Barks, the more it seemed to me that Scrooge's sled dog Barko was an autobiographical projection. The equivalence of names alone was too strong to ignore. In 1989 I asked the artist point-blank to confirm this, but he just grunted, "Barko seemed to be a logical name for a dog. He wasn't named after me." Well, if the great man wanted to be coy, that was his business. I knew that Barko, like Scrooge, was a frontiersman, an emblem of the tough but honest way of life with which Barks had long identified. Scrooge is the artist's reclusive nature, Barko is more outgoing, but when the chips are down, they pull together. "North of the Yukon" presents us with two faces of an aging champion who still has what it takes to beat modern courts, cons, and media campaigns. You tell me that isn't a story about Barks.. The US 59 story : ”North of the Yukon” is very special - and maybe Carl felt more associated with the US-59 story ( and the famous sled dog ; Barko ) than he would admit officially. Remember the fact that the U$59 story : ”North of The Yukon” was the only $crooge story Carl kept and saved in his own archive of the 5 $crooge stories he received from his editor. 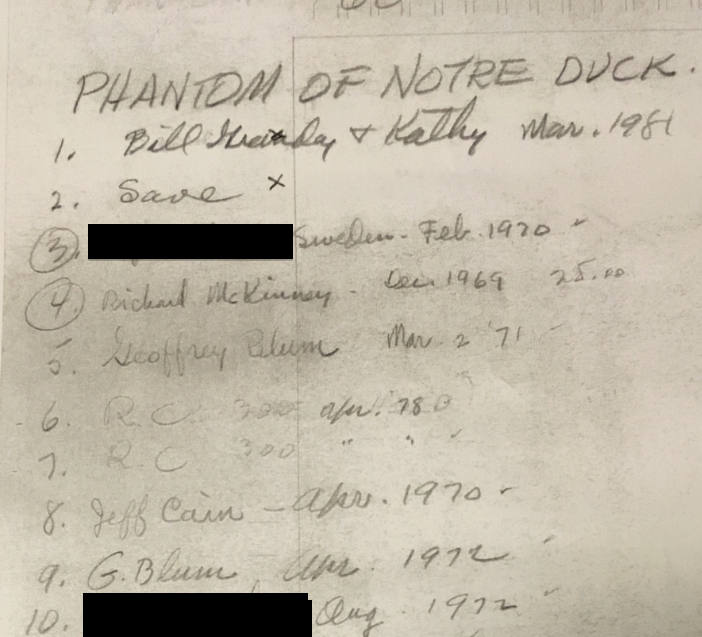 Carl`s personal selling notes for the Uncle Scrooge story ; "Phantom of Notre Duck" from 1965. The whole 24 pager from this story has survived. 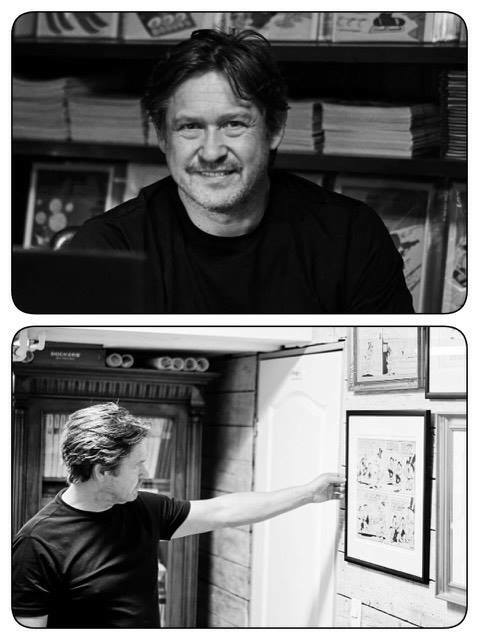 The original comic book art are in private collections spread all over the world. Once in a while you might be lucky to find a page for sale on auctions. 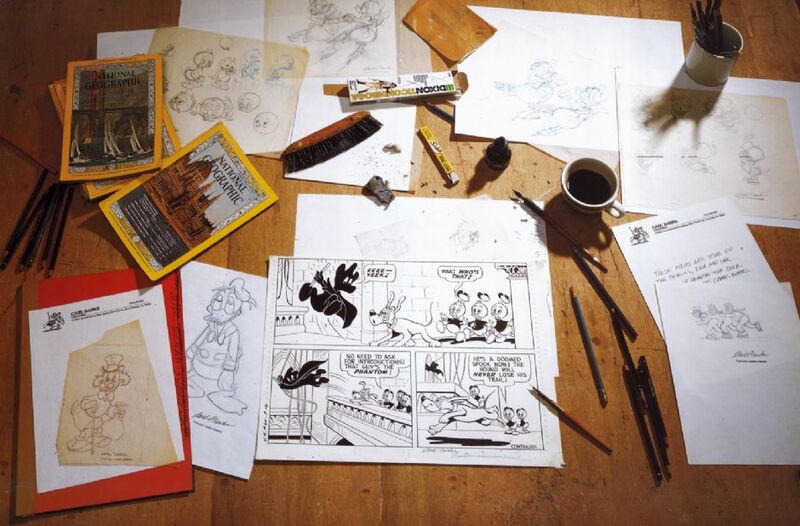 Carl`s handwritten selling notes for the Uncle Scrooge 24-pager ; "So Far and No Safari" from 1965. Carl mixed some pages around..! ( page 17 - 22 ). Carl`s handwritten page selling list for US-62 : "Queen of The Wild Dog Pack" 1965. Carl always wrote the buyers name, month / year of selling and last the price of the page. This is Carl`s handwritten selling note for the Uncle Scrooge story : "House of Haunts" from 1965. In respect of the original buyers who still own their page their name has been blocked in black.